The mission of the Metcalf Institute is to promote clear and accurate reporting of scientific news and environmental issues; to strengthen understanding and working relationships between members of the scientific community and members of the news media; and to provide opportunities for beginning journalists to learn, on both a formal and an informal level, how to improve their skills in marine and environmental reporting. Metcalf Executive Director Sunshine Menezes on the Metcalf mission. The Metcalf Institute provides fellowships each year for journalists in print, broadcast, and electronic media to learn about science and the research process, from interpreting marine and environmental issues to understanding the principles of scientific research. Annual Science Immersion Workshop for Journalists, a one-week immersion workshop that provides 12-14 journalists with basic scientific training in the field and laboratory. Science Seminar for Journalists, two-day seminars for journalists featuring leading environmental scientists and writers on the communication of scientific topics. News Executives Roundtable: Covering Climate Change, a one day workshop for top news executives in which leading climate scientists and economists outlined the science underlying one of the most important issues facing us today. Scientists and Journalists: Getting the Point Across, an annual public lecture series for the public, scientists, and journalists about environmental and scientific news and journalism. Environment Writer, an online newsletter that provides background information for journalists who report on environment. Metcalf Institute administers the Grantham Prize for Excellence in Reporting on the Environment. Launched in 2005, the Grantham Prize is annually awarded for exemplary nonfiction work originally produced within the United States or Canada that deals with environmental issues. The purpose of the prize is to encourage outstanding coverage of the environment, to recognize reporting that has the potential to bring about constructive change, and to broadly disseminate the Prize-winning story to increase public awareness and understanding of issues focusing on the environment. The $75,000 Grantham Prize, funded through The Grantham Foundation for the Protection of the Environment, is the largest journalism prize in the world. The Metcalf Institute is administered by Dr. Sunshine Menezes, Executive Director, Dr. Tatiana Rynearson, GSO Professor of Oceanography and Science Co-Director, and Peter Lord, Environment Writer, The Providence Journal and Journalism Co-Director. Metcalf Institute's full Advisory Board meets with the directors at least three times per year. Dr. David Farmer, Dean of the URI Graduate School of Oceanography, oversees the Metcalf Institute. The Metcalf Institute endowment was established at URI's Graduate School of Oceanography in 1997 with funding from three media foundations: The Providence Journal Charitable Foundation, the A.H. Belo Corp., parent company of The Providence Journal, and the Philip L. Graham Fund, The Washington Post. The Metcalf Institute was named in honor of Michael P. Metcalf, the late publisher of The Providence Journal, who was keenly interested in marine and environmental issues and was known for his integrity, vision, and high standards for writing. The Telaka Foundation provided additional funding in 1998. The Metcalf Institute endowment is managed by the University of Rhode Island Foundation, a nonprofit, tax-exempt charitable corporation. 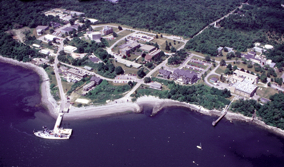 The URI Graduate School of Oceanography (GSO) is located on the University's 200-acre Narragansett Bay Campus. On Narragansett Bay's West Passage, with a deep-water pier and easy access to the open Atlantic, the campus offers an ideal location from which to explore the world ocean. Members of the GSO community meet research challenges that confront the nation and the world. GSO faculty and facilities address such issues as climate change, hurricanes, pollution, fisheries depletion, and the need for new technology for undersea research and exploration. The campus has grown steadily since the founding of the URI Narragansett Marine Laboratory in 1936. The most recent addition to the GSO campus is the Ocean Science & Exploration Center, which houses the Inner Space Center. Via satellite telecommunication, the Inner Space Center enables researchers and students to monitor, track and disseminate information from oceanographic expeditions and remotely operated vehicles in real time. Metcalf Institute is located in the Graduate School of Oceanography's Coastal Institute, Room 127 (Directions).